For Mitt Romney, usually a less than stunning speaker, tonight’s speech was surprising in its passion and delivery. Pundits noted this speech was likely his best. He delivered a number of compelling lines including ones that don’t quite ring true for the most obstructionist republican party in seven decades. Lines like: ‘I wish President Obama had succeeded.’ I wonder if a party that reinvented the term filibuster can honestly say they agree? 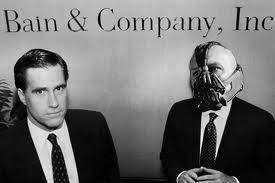 If Romney felt such a sentiment, it was a good one. Sorry to see it hasn’t born out among the vast majority of republicans. That said, the most out-of-context reference in the entire speech occurred when Romney made light of the issue of global warming. Romney, in a rhetorical jab at Obama, poked fun at Obama’s promise to help stop sea level rise and begin to heal the planet. This jab is especially concerning when one looks at Romney’s energy plan which could well be described as coughing carbon dioxide. His promise to double down on fossil fuels, including coal, will certainly do further harm to an already fragile world climate. These assaults on the validity of global warming science fly directly in the face of fact and reality. Romney’s loud whistle past the climate change graveyard happens during a year of unprecedented sea ice melt, during the hottest year on record in America, during the worst drought in fifty years and during a year of record fires around the world. This belittling of an issue that is sure to have ever-increasing impact is nothing short of blatant irresponsibility. Romney claims to be concerned for families, for our future. But an ever-increasing amount of harm will come to our families and our future should we fail to respond to the very real danger of climate change. Yet the most poignant note of the convention, for me, was watching children playing in the balloon drop. What will happen to them if their republican parents are wrong in their assertions? What will happen to them if the worst potentials of climate change are brought on by a sudden increase in dependence on fossil fuels? What happens to them in 20 years when the US farmlands are even drier than they are today? 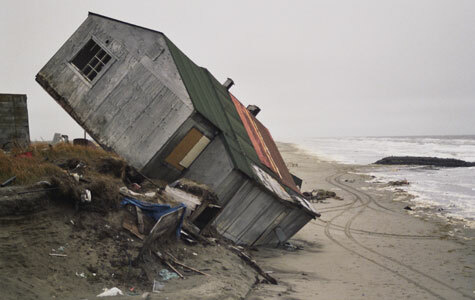 What happens if coastlines start to destabilize? How much poorer, more desperate and afraid will they be in such an uncertain and increasingly hostile place? 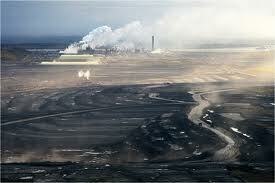 Romney speaks of the future even as he seeks to force dependence on the energy sources that may ruin it. And he brazenly laughs at the very climate change increasing use of those fuels would intensify. History will judge Romney very harshly on these points. And such judgement will be far more harsh should a Romney Presidency steer us full-speed into the teeth of climate change. 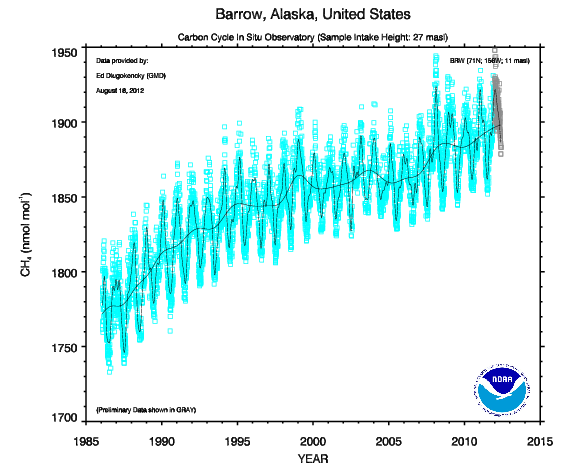 Ever since the middle of the twentieth century, Arctic warming has been a clear trend to those studying climate. Now, more than a half-century later, we are witnessing what appears to be the rapid demise of Arctic sea ice. 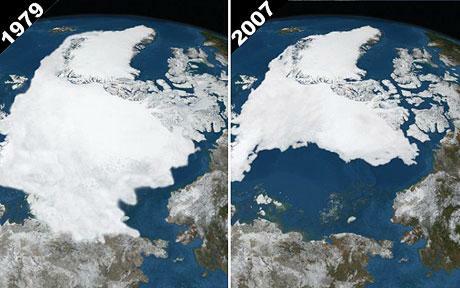 For 2012, sea ice decline has been inexorable even after a stunning record loss just five years before. With more than two weeks remaining in the melt season, sea ice extent is about 420,000 square kilometers below the record set in 2007 while sea ice area is about 460,000 square kilometers below the record low set last year. If these measurements do not shatter the doubts of skeptics, deniers, and other unrealistic or traumatized persons, then nothing will. Those who cannot recognize these obvious and powerful trends have become inoculated to facts, immune to observations of the world around them, locked in a padded room of their own choosing. In comparison with past record lows, this year alone is a 10% decline for sea ice extent and a 16% decline for sea ice area. With melt still continuing on an almost daily basis, we can expect these percentages to rise throughout the next couple of weeks. If current rates of decline hold for just the next seven days, we can expect to see loss values for both extent and area exceed 700,000 square kilometers (a 17% decline for extent and a 24% decline for area). If current decline rates hold for another week and a half, the percentage of sea ice area lost will approach the loss for 2007 — 27%. For an increasing number of scientists and Arctic observers, the number of years remaining is swiftly shrinking. Just this year, a team of British scientists have indicated we could see nearly ice-free seas within a decade. This observation parallels those made by scientists at the Polar Science Center at the University of Washington whose sea ice volume measurements indicated a potential for near ice-free summers within the next five to ten years. Even Andrew Revkin, who has been very reluctant to admit the potential for ice-free summers in the near future, has now said that there’s about a 50% possibility for ice-free conditions within the next twenty years. Five years ago, before the amazing summer melt of 2007, a person predicting a 50% chance for ice-free summers within twenty years would have faced scorn and derision. Most models indicated that the Arctic Ocean could experience a late summer ice-free condition by the end of this century. A seemingly comfortable, far off time that most didn’t worry about. Now, events are more pressing and far more immediate. Simply put, we are bearing unbelieving witness to the rapid loss of our north polar ice. Many of us just can’t abide with the fact that rates of ice loss indicate a high potential for nearly ice-free summers within the next 5-20 years. It would take just two more melt seasons like the ones we’ve experienced this year and the one we experienced in 2007, to push sea ice area below 500,000 square kilometers and sea ice extent below 2 million square kilometers. When you consider the fact that these totals are smaller than Greenland, it would be more than fair to call this a nearly ice-free state. When taking into account past summer sea ice extent values at above 10 million square kilometers, this would represent a more than 80% loss since the early 20th century. Using the same measure, we have currently lost more than 62% of sea ice for end of summer since the early 20th century. Most of this loss has occurred since the mid 1970s. So though loss is high over the course of the past 100 years, it is concentrated toward the end of the period. 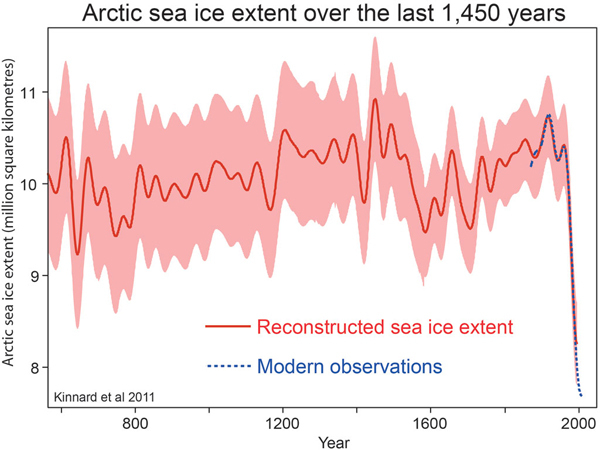 To further put the unprecedented nature of this ice-loss period into perspective, it has been found through observations of the age of drift wood frozen in sea ice that this period of melt is the greatest seen in 3000 years. With melt continuing, this 3000 year marker is just a snap-shot of a dynamic and increasingly severe melt event. In the context of greenhouse gas concentration and forcing, we are currently at levels not seen in about 3 million years. So should these CO2 concentrations remain or continue to increase, we are likely to speed past the 3000 year melt mark and on into even less familiar territory. Today sea ice extent continued its inexorable push into record territory. According to the Japanese Space Agency’s sea ice monitor, Arctic sea ice reached a new record low today and for the first time dipped below 4 million square kilometers. The observation showed 3,947,500 square kilometers. This level is about 50,000 square kilometers below yesterday’s value and about 300,000 square kilometers below the record low set in 2007. The Cryosphere Today site appears to be down today. But yesterday’s measure was also in record low territory at 2,643,000 square kilometers for sea ice area. A good reference for this size is the land area of Greenland itself, which is 2.1 million square kilometers. NSIDC published a report on this year’s historic decline yesterday. You can view the report here. 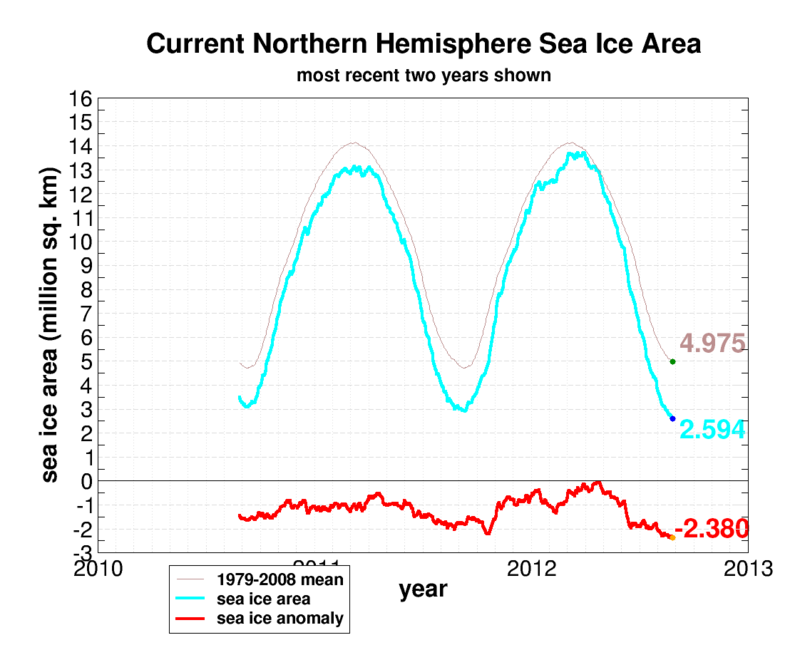 Currently, NSIDC is also showing continuing declines for sea ice extent. Based on the latest observation, NSIDC’s extent measure is also approaching the historic 4 million square kilometer mark. The most recent graph for sea ice area from the Cryosphere Today website has finally published. 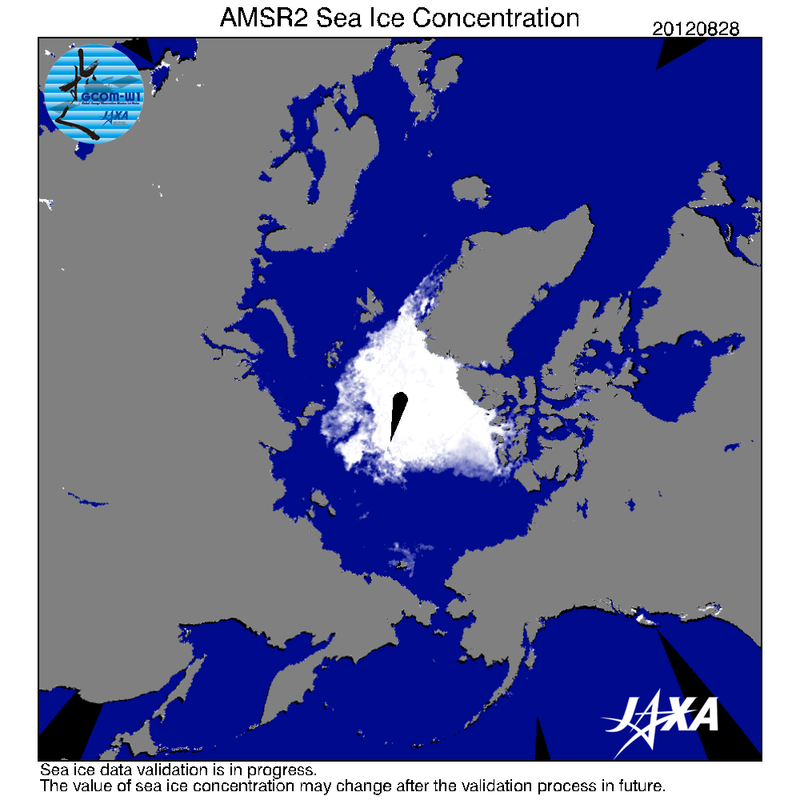 It shows sea ice area continuing its rapid decline. The area measurement for today shows 2,594,000 square kilometers of sea ice remaining. This is 49,000 square kilometers below yesterday’s measurement and 296,000 square kilometers below the record low set in 2011. Well, we are finally having a few articles on this summer’s record Arctic sea ice melt start to trickle in. And one I’d like to focus on, in particular, comes from Andrew Revkin over at the New York Times. The article entitled “Arctic Sea Ice Hits New and Early Summer Low for Satellite Era” does some justice to the current epic melt going on in the Arctic. However, it provides undue coverage for those claiming ‘natural variability’ may have influenced this record low. This is typical of current mainstream media coverage, which was rife with this false equivalency in recent papers on the 1000 year melt occurring in West Antarctica. And, going forward, it is very important to address this argument directly. When taken in context of the larger trend, any reasonable assertions for major events being caused by natural variability evaporate. But poor Andrew clings to it like a melting iceberg in a stormy Arctic Sea. 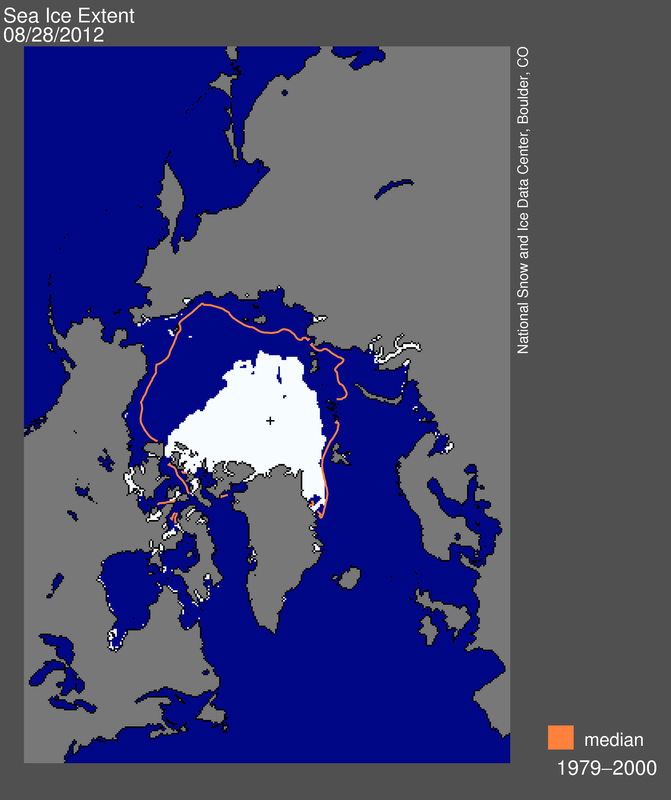 I think a more accurate prediction would be for about a 50% chance of an ice-free or nearly ice-free (less than 500,000 square kilometers extent, less than 300,000 square kilometers area) Arctic Ocean during summer months within 10 years. I’d say, given the factors below, we are closer to 70-80% within the two decades you mentioned. 1. We have year-on-year volume declines. 2. We have a precipitous fall in sea ice extent and area for this decade and we are less than half the coverage seen in 1980. 3. The rate of decline is increasing for summer months. 4. The ice is fragile now, making it more susceptible to storms like the cyclone we saw this month. The fragile state of sea ice increases the kinds of events that can result in rapid melt. 5. The elongated atmospheric wave patterns created by Arctic melt enhance melt by transporting more warm air into the Arctic. 6. The loss of sea ice enhances Arctic methane release, adding to local warming and enhancing global warming. 7. 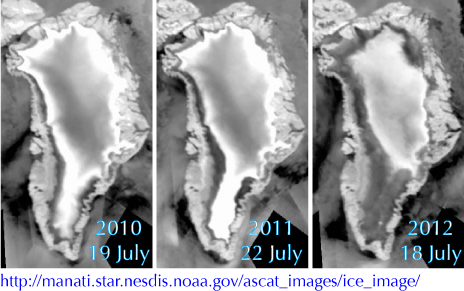 The loss of sea ice reduces albedo, creating a powerful feedback for enhanced melt during the summer months. As for the scientists who are taking the ‘complexity’ argument. Events on the ground seem to have vastly over-ridden these analysis. I think it is fair to say that the primary driver of global weather events and any radical change in environments around the world is via the mechanism of global warming. Variability is just the small noise happening on top of the larger trend — much like foam will form on the top of a violent wave. You have to take things vastly out of context to make the variability argument. Those making that argument are looking at data-sets that are too narrow. One obvious proof of this is that we aren’t having any major anomalies on the ‘cold’ side of the equation. Everything, all the weather and climate data, points to warming and impacts and feedbacks caused by warming. The same people who are making the complexity argument were the ones who were saying Arctic sea ice would recover — it clearly hasn’t. The only likely driver for an Arctic sea ice recovery would be something on the order of a large Greenland melt — dumping cold melt water and ice bergs at a very high rate into the northern oceans. This might slow down melt or even cause some freeze-back. But this really isn’t an event we want to witness, is it? In general, the mainstream media has dropped the ball in a major way. The loss of Arctic sea ice for this decade is historic. It is both a major weather and climate event. And, as such, it should be covered by the major weather news sources. 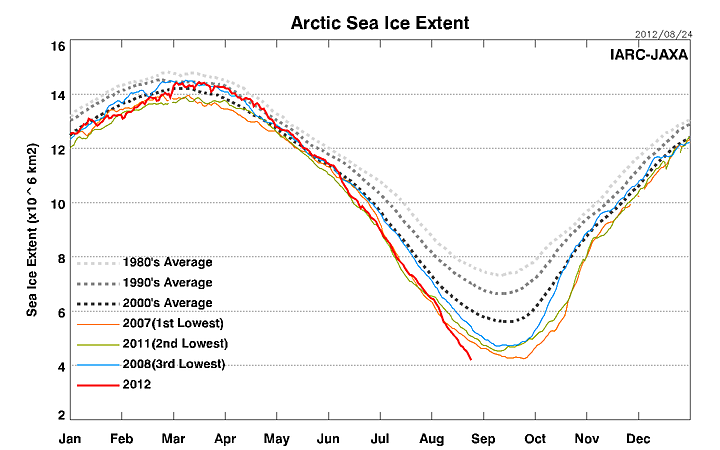 The 2007 record low for Arctic sea ice was historic and yet there was hardly a peep from the mainstream media. This year, we have had major melting events both for Greenland and for the Arctic sea ice. Within the Arctic was saw major wildfires throughout Siberia. And just last year we had a rather large pulse of methane coming from the ocean as well as the Arctic tundra. Again, these are weather and climate related events. Yet the discussion is still at the level of denial. At the level of arguing over whether these events are normal or are they really happening. This is not the kind of coverage we need. We need an identification and a rational discussion of an ongoing problem. As yet, there are no adults in the room. Just a number of children who appear to be in varying states of trauma. Revkin does give valid information on most days. And his prediction that there may be a 50% chance of an essentially ice-free Arctic within two decades is certainly movement on the issue. But his false equivalency given to those claiming ‘natural variability’ is unqualified given that these statements are entirely out of context. Today sea ice extent monitors continued to push toward new record lows. 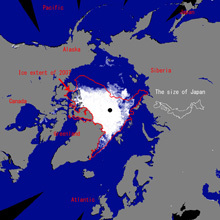 Measurements taken from the Japanese Space Agency for this date showed sea ice extent at 4,333,000 square kilometers. This is about 70,000 square kilometers below yesterday’s total and about 130,000 square kilometers above the low set in 2007. At the current rate of melt, this record will be broken within the next 2-3 days. NSIDC also showed sea ice extent measures continue to fall. 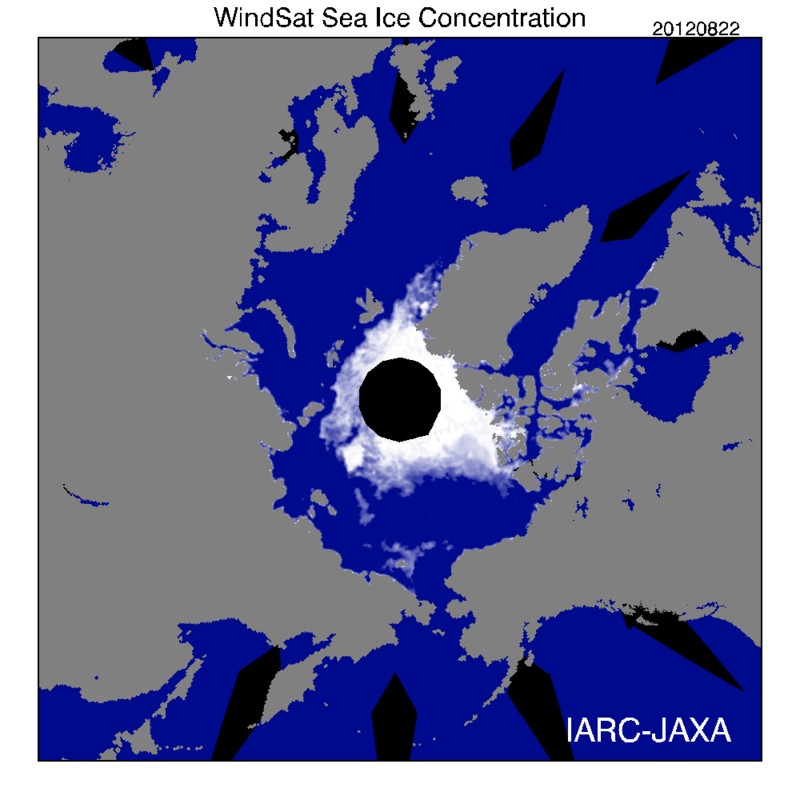 The extent of sea ice shown by NSIDC is very close to that of JAXA. So should melt rates hold, we should see a new record for NSIDC ice extent within the coming days as well. Sea Ice area, as measured by Cryosphere Today, showed a slight freeze back today with about 51,000 square kilometers of sea ice area recovered. These kind of small freeze-backs tend to occur during this time of year. However, they usually overlay a slowing downward trend. Currently the record low for sea ice area was set yesterday and stands at 2,742,000 square kilometers or 163,000 square kilometers below the previous record low. 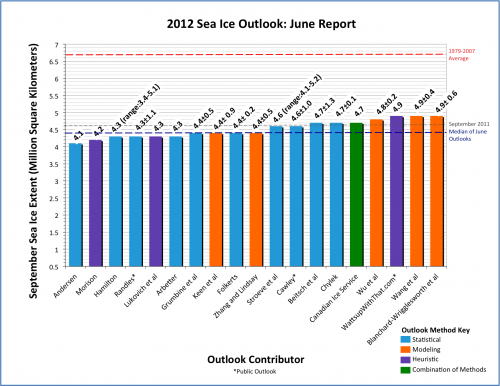 In total, about nine different reports track various values for sea ice in the Arctic. So far, according to Neven’s ‘domino count,’ five of these reports are now showing that Arctic Sea ice has reached a new record low for this year. The ‘domino count’ has increased by one since yesterday with Cryosphere Today’s arctic basin sea ice area measurement showing a new record low. Lastly, I’d like to give you a little analysis about the potential for future melt. A region of ice in the Kara, Laptev, and Barents seas has been undergoing rapid melt over the past 5 days. This area continues to show thinning ice pulling back in toward the polar region. The area is large compared to the remaining ice sheet, and could provide significant further melting. From this region runs a thick band of fragmented and fragile ice through the East Siberian and Beaufort seas around to the Queen Elizabeth Islands. Though the angle of the sun is getting lower, there is still a lot of warm air and water moving around in the Arctic. So these regions of fragile ice will remain vulnerable to adverse weather throughout the coming weeks. In short, due to the thin and fragmented nature of the ice in the regions described, there is still potential for significant melt through mid September. Though cooler temperatures graced the mid-section of the country this week, the most recent report from the US Drought Monitor shows that the worst drought since 1956 continued to deepen over much of the country. In total, more than 63% of the land area of the continental US suffered from drought conditions. This is an increase of 1% over last week’s drought report which showed 62% of the US mainland suffering from drought. Fully thirty percent of the US was suffering from extreme or exceptional drought, about the same levels as last week. That said, beneficial rains in the Ohio valley resulted in slightly less farmland being gripped by drought. According to the Drought Monitor, 85% of the U.S. corn crop, 83% of soybeans, 63% of hay, and 71% of cattle areas are still experiencing drought. Though this number is a slight improvement, it is still a very large swath of US agriculture. Other impacts from the ongoing drought this week included large regions affected by fires. California, Idaho, Oregon, and Washington all experienced large blazes. Idaho has experienced its worst fire year on record and so far the United States has seen the most area burned for this time of year. 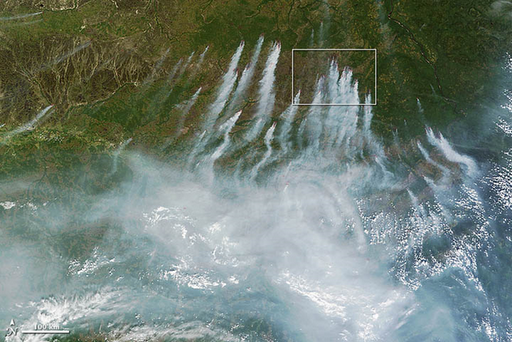 Fires continued to rage in far eastern Russia, but most Siberian fires are now currently contained. The Balkans also experienced a major outbreak of wildfires during an extreme heat wave that resulted in numerous heat deaths and temperatures soaring to well over 104 degrees in many places. Spain saw fires continue both on the mainland and on one of its islands. Greece saw a major wildfire engulf one of its islands as well. The Mississippi river experienced sporadic interruptions of traffic with sections of the river shut down on Monday, Tuesday, and Wednesday of this week. Though the river has been running low throughout the summer, this is the first time that major traffic interruptions have occurred. Worldwide, large areas of drought also affected the Balkan states, swaths of Europe, parts of India, and large sections of Asia. The UN has recommended that nations begin setting up plans to deal with long-term droughts and the number of climate scientists linking the current droughts and extreme weather events to climate change continues to grow. A number of recent articles and reports from Geophysical Research Letters, WeatherUnderground, Climate Progress, and Climate Central have highlighted how loss of Arctic sea ice helps to create extreme weather events over the northern hemisphere. In short, the loss of ice moves the polar wind patterns and changes temperatures there in such a way as to create giant, lumbering atmospheric waves. 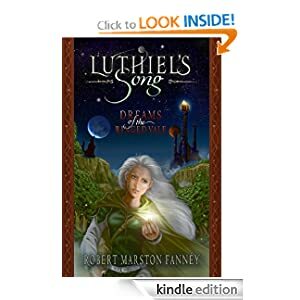 Now imagine a huge wave of air swooping down from the Arctic, digging deep into the mid-latitudes, and then swooping back up toward the poles again. This is what is happening with greater and greater frequency as Arctic sea ice continues to fade. The wave patterns created are not only deeper, moving air through zones that typically have a variety of temperature and moisture conditions, they are also longer-lasting. The result is that you get an increasing number of zones of extreme, non-typical conditions parked over regions of the world for longer and longer time-periods. This summer’s drought is one example of a persistent weather condition caused by these atmospheric waves. One issue that researchers have raised is that these blocking patterns tend to establish themselves consistently over similar regions. What this means is that it is more likely for certain zones to experience a certain kind of blocking pattern. This is one feature that has helped to enhance drought and drying conditions in the central US throughout the past decade. These blocking patterns have another dark side. They transport warmer air into the Arctic, pushing temperatures closer to those of surrounding regions and further amplifying melt and carbon feedback. One typical pattern is a flow that pulls heat and moisture from as far south as the Gulf of Mexico and deposits that air near or over Greenland. This kind of flow had an influence on the extreme melt conditions that occurred there this year. If these kinds of flows are to become more common, we can expect to experience similar, or possibly more extreme, melting over Greenland in the years to come. 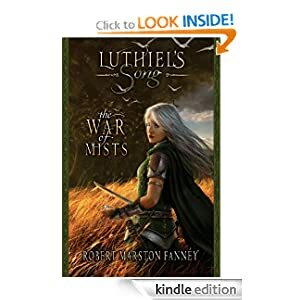 This strange elongating of atmospheric wave patterns creating persistent weather and increasing the likelihood for extreme, long-lasting conditions, overlaps a long-term regime of increasing temperatures. 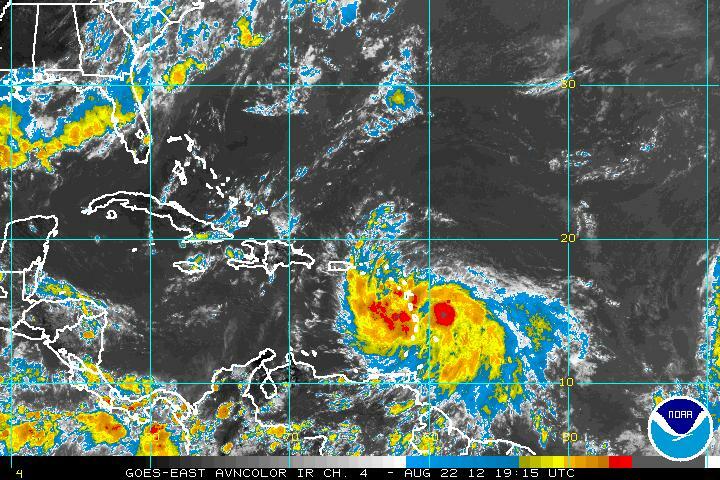 So more extreme weather is combining with hotter weather overall to create a very volatile brew. It is certainly worth watching if you have the time. In any case, changes to the Arctic caused by global warming are leading to more extreme weather patterns. 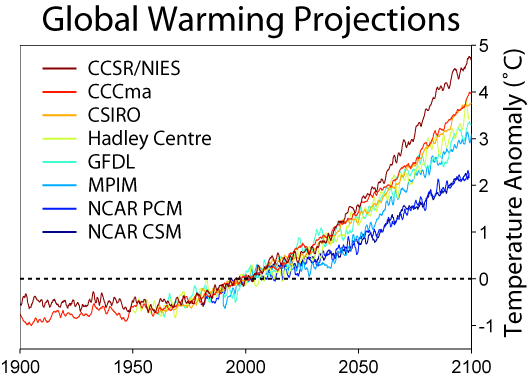 This impact shows that the climate response to a warming world is non-linear. It creates unexpected changes and extremes that severely alter our world. This change has happened in a world that has warmed, on average, about 1 degree Celsius since the 1880s. If such large atmospheric changes can occur with relatively ‘small’ temperature changes, one can imagine how much more strange and severe the weather may become with 1, 2, 4 or 6 degrees of additional warming.